Re: Daytona possible XX29L9B400573 ?? Great that it survived all these years from going overseas and back to the US, but That's too many dam ugly shades of brown than the inside of a septic tank truck! makes F8 almost palatable... 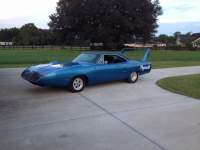 I think I'll remember this Tona' as the "Hersey squirt Tona' " rather than the "Nuremberg Tona' "
I am looking for information on the original and second owners of our 1969 Dodge Daytona VIN: XX29L9B400573. It was shipped to Bill Breck Dodge in Colorado Springs, CO on 8-26-69. It is a rare T7 paint with white tail, 440 4-speed. It was repainted a red and or orange color early in its life and then white. It is known as the Nuremberg Daytona for its time and escapades in Germany in the early 70s. The original US Soldier took it to German where it changed hands twice. The second owner was Mike Whitlow the third owner was Helmut Aulgur, It then returned to the States and was owned by Tom Blackett of S. CA. I am looking for vintage photos of the car and info on previous owners. Thank you for any help or clues you might be able to provide. Photo of car as it is now back to factory original specs is attached. i'm gonna have to disagree. this is one of the sharpest color combos they made. There was a big story on this car on the internet somewhere that chronicled the whole life of this car. It was an interesting read. I think it was done by the place that restored it. If someone can post the link it’s definitely worth the read. Drinking and driving is really, really stupid. The diatribe of the 'color haters' grows old. It is a gorgeous color & looks awesome with that interior. Colour is a very personal thing…..there is no wrong or right. Personally I have not got a problem with it and owned a Jeep a very similar colour. I have to disagree (personally!) about the interior...I don't mind the colour of it but interiors should compliment or contrast with the exterior….not match it. My father had red leather in a white car with black wheels.....looked amazing! If at first you don't succeed, skydiving is not for you !! I love the color combo, thats what I love about Mopars, the color spectrum was all over the place.